The bad news is I’m losing my vision in one eye rather rapidly. The good news is its a cataract. The bad news is no one knows why I would suddenly grow a cataract in one eye at age forty. The good news is that lots and lots of people have this surgery- almost half of people in the US have had it by age eighty. The bad news is that they fix it with a knife. The good news is that I get a corrective lens implant, meaning that in that eye I will have much, much better vision, even without glasses. The bad news is, I’m a little afraid. The good news is, I get to keep my sight. The colors are off, because it’s night time here. The olive is one of those fabrics where the warp is one color and the weft is another, and together they make a third color. The yellows are really a variety of oranges. 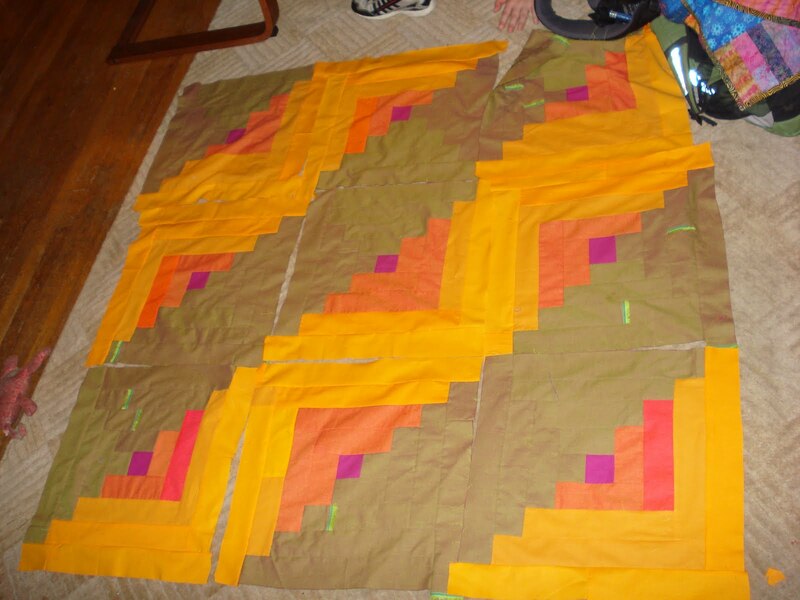 I think I will make sixteen blocks, so that it will be a perfect square. Work was sloooowwwww. I have a co worker who is offended by mu knitting during slow times. Oddly, she is not offended by web surfing, novel reading, or phone conversing, but hey, I don’t make waves. Tomorrow I am three people all at once, so that may make the day move more briskly. We shall see. 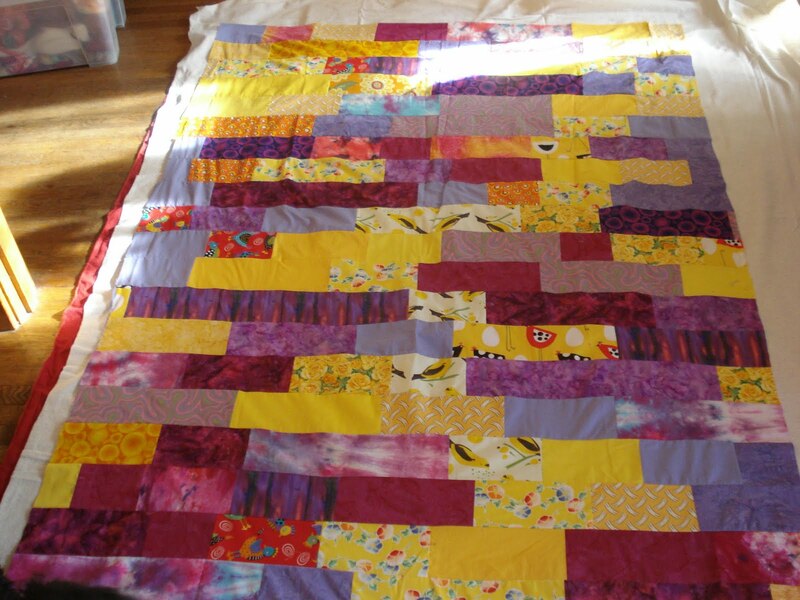 Here is the top for my niece’s quilt. I was ready to pin it, but it seemed to narrow. So I picked it up again and am adding some to the sides. I had a surprising amount of yellow, purple, and yellow and purple fabric. I used 4.5 inch strips cut to random lengths. I have also changed my mind about the back. Most of my utility type quilts have a back made from a red sheet. I love the color of IKEA’s red sheets, and a $5 quilt back can’t be beat, in my book. ( I wash the sheet first in really HOT water, and dry it HOT because it is prone to a little more shrinkage than quilt fabric. I also just tear the hems off to square it up, as it is never hemmed exactly on square. Then I crochet rugs with the torn off hems. ) But, my niece has an aversion to red, so I will take a look at the stash or maybe go to the quilt store and look in the sale bin. I hope she likes it. I have to get the rug vacuumed, the kids at school, and the dogs locked up to lay it out again! Oh well, such is life. We had a real nice set of holidays. I had Christmas off for the first time since becoming a nurse. Lucky, really, as the higher seniority people wanted the overtime pay and not the time off, so it fell to me to hang around with my kids. Even though we don’t celebrate Christmas, it was nice. We were going to go to a movie and get Chinese food, somewhat of a Jewish tradition, but it turned out we stayed home instead.